WSG Practice Groups: Not Just Another Place For Your Picture! So you have joined a WSG Practice Group. Now what? While joining a WSG group is the first step, unless you regularly engage and participate, you’ll never receive value from your membership. The same goes for any other WSG, practice or industry groups you join. Consider these 5 tips to optimize your membership and reap the benefits today! Start or participate in forum discussions and messages – Beginning or participating in forum discussions are great ways to engage in conversations about a specific topic or current issue. 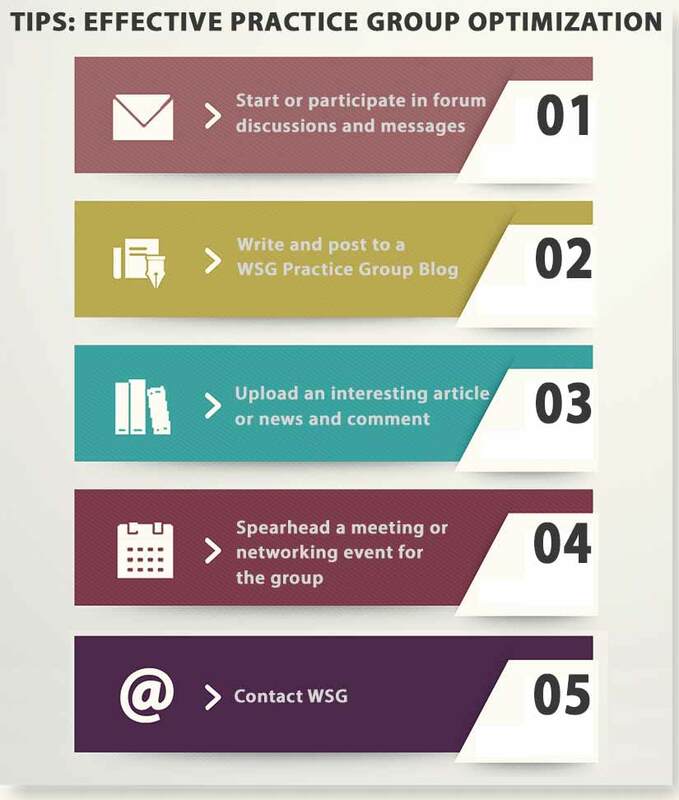 All WSG Practice Group members can easily access forum discussions without having to travel, contribute in a meaningful manner, and follow the discussion in real time as it develops. Similarly, sending a message through the messaging tool can instantly connect you to individuals who share the same interests. Messages can be sent to the entire practice group or you can narrow your conversation and select as few group members as you wish. Write and post to a WSG Practice Group Blog – For the “adventurous” type that enjoys an interactive and visible dialog with other members, writing a practice group blog is a great way to highlight and promote specialized knowledge and experience in order to create thought-leadership and global recognition. These posts are automatically distributed to WSG members of the group to further engagement, and posted on the collective Practice Group blog. More importantly, a blog can be read by existing and prospective clients and partners, allowing them to develop an intimate level of trust in you. Upload an interesting article or piece of news and comment on it – For the less adventurous users (think more: “invisible user”) that actively consume information but are less likely to develop original content, uploading an article is a great way to draw attention and drive conversation around practice areas and interests most important to you and your firm. Include a paragraph or two about why you think the information is relevant or add a comment about “how I see it”. Spearhead a meeting or networking event with WSG for the group – A group can decide to meet and discuss best practice strategies, current trends or important news in a given practice industry. Means of meeting include a cocktail reception in conjunction with a larger event, an annual hosted practice group meeting, or even a small breakfast on the day of a happening. Meeting members face-to-face is a great way to create momentum within a group and forge strong network relationships and referral opportunities. Contact WSG! Not that we’re your mother, but we want to hear from you on a regular basis, even if it’s a quick note letting us know what is going on. We welcome details about collaborations forged together through the network’s practice group participation to further demonstrate how professionals are making a difference in today’s business world by being part of a smart and premier network. We look forward to working with you to further the valuable resources WSG has to offer, enhancing your network of professionals in your practice industries today! If you have any questions or suggestions, please contact the Practice Group Administrator, Gaby Saldaña at [email protected].